Discussion in 'Electric Instruments' started by JohnnyStrings, Feb 11, 2018. I'm curious about specific tonal comparisons between the mahogany/maple vs. korina McCarty... I'm in the market for juat one new guitar, used around $1500 give or take. Way back when I owned a McInturff Taurus Sportster, which was a chambered mahogany beast with a nice coil split: I would play a plain old first position chord on that through a Cart Slant 6V, and just smile. No Carr amp anymore either, but a Supersonic 22 is close. 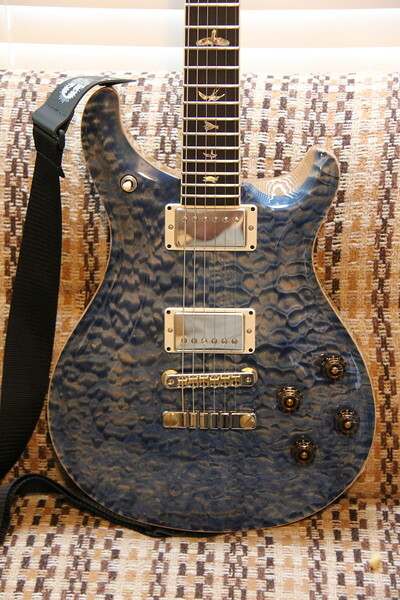 Since TCMs are now few and far between (and PRS quality being a factor therein), I'm looking at PRS, specifically the thick-bodied McCarty models. So, I wonder which model would better range from a ballsy, spanky split-coil strat tone (a-la SRV Lenny, to sustained leads and tight chunky rhythms, a-la Dream Theater? A tall order, but maybe Korina can tackle it? I know multiple guitars is always the best answer, but I'm askin' anyway. Thanks for the insight. Dusty Chalk and dogrocketp like this. Of the two McCartys that I have, I would choose the Korina and, if needed, change the pickups to something that splits better than the original pickups. The Korina has the added benefit of being lighter in weight than my other McCarty. What I would love to hear one day is a PRS with a maple top and korina back/neck. Maybe with 57/08s. The maple top may give it an extra special kick of brightness. DreamTheaterRules, TwelfthTangent and JohnnyStrings like this. The difference is anger and grit. The korina has an anger to it, a grittiness that you won't get with a warmer maple cap. DreamTheaterRules and JohnnyStrings like this. They’re both nice, but I’ll point out the obvious — a traditional humbucker guitar with a set neck is not going to give you the tones of a single coil guitar with a plastic pickguard and a bolt on maple neck like SRV, whether it’s made from Mahogany/Maple, Korina or Semolina. There are simply too many differences in construction, pickups, scale length, hardware, etc., for that to happen. Horses for courses. You probably already know this, but I’ll point it out just in case. There are PRSes that will come close, but the McCarty is a different thing. Dusty Chalk, dogrocketp and JohnnyStrings like this. My semolina guitar is relegated to late night noodling. Dirty_Boogie, Tramp, DreamTheaterRules and 7 others like this. One other thing about Korina...out of all of my PRS guitars (Swamp Ash Specials with NF, Artist Custom 24 with 85/15, Artist Brazilian McCarty with 58/15LT, Brazilian 408, DC3, etc), the Korina McCarty (with McCarty pups) sounds the meanest when overdriven. Its hard to believe that something so 'pretty' and perfectly sweet looking can sound SO nasty. If there are multiple guitars to choose from, I strongly recommend playing them before purchasing (if possible). In my case, I initially bought 2 Korina McCarty guitars. Same year of production, same specs, same neck carve, etc but one didnt sound nearly as good as the other one. I ended up selling the backup one and I kept the one that spoke to me. Coincidentally, the one that spoke to me happened to be RED. eclecticsynergy, dogrocketp, Alnus Rubra and 1 other person like this. Thanks for the responses. I'm going to wing it with korina. I've been cruising youtube and something about how articulate it is, even in a video with some novice (not unlike myself in far too many regards) pushing it through some crushing deep, heavy solid state distortion, it was still articulate, and while angry, still very nice tonally. Thanks again. veinbuster and Casi1 like this. Hahaha! My first laugh of the day! Very good! There was a 10 - 12 guitar run of full korina DGTs a few years ago that might fit the bill. Hard to find though as they don’t pop up for sale often. There are other DGTs with korina body, necks and maple cap, and ones with just a korina neck. My favorite guitar and the only one I regret selling was a Wood Library DGT with hog back, korina neck, and Brazilian fretboard. The DGT can play anything, best control layout, great split tones and nice thick body. You will have trouble getting them at your price range though in most cases, especially if you are trying for one with korina on it in one way or another. I still haven't pulled the trigger yet... the mahogany/maple tone set, by the book, seems to match up with some of my likes (e.g. Dream mentioned in first post)... and sure, the amp and an EQ pedal can probably dial in whatever I need, but I don't want to fight the guitar's natural tendencies too much, and I worry I might spend too much time removing unwanted mids. Then again maybe that's easier than trying to add them back when the occasion warrants it. Thanks for entertaining my waffling. Waffling is always entertaining. Everyone can relate. And soon you’ll be entertaining us with a pic of your new whatever-it-is. If you’re going back and forth, it doesn’t sound like you’re much of a gambler. You really should play both and then decide, but then, being sensible and actually experiencing the goods is unfashionable in these internet times. Of course, that’s one reason there are so many used guitars, amps and doodads flooding the market. dogrocketp, JohnnyStrings and Alnus Rubra like this. The obvious answer is to buy both, but two guitars are harder to sneak pasta wife. eclecticsynergy, Alnus Rubra, Dusty Chalk and 3 others like this. Korina back/neck, Brazilian board, 57/08 bridge, 58/15lt neck. Lots of cajones, with a killer split neck sound, although the CU24 in between switch positions do a closer Strat impression. Alnus Rubra, cshallcross, Bill SAS 513 and 6 others like this. I live a bit out in the sticks, but recognize that's still a poor excuse for not spending a weekend in my old college town of La Crosse WI, which remains less than 4 hours away and is home to that heaven known as Dave's Guitar Shop. But anyway - I've completed my waffle and just made an offer on a used mahogany/maple McCarty, and will certainly entertain with details once the deal is done. Excellent! After you've played the snot out of it for a couple of months, you can buy another one! Here it is. Just arrived today At 7.8 lbs it's just a touch lighter than my recent nothing-special AmStd HSS strat. Plays like a breeze. Haven't restrung it yet... intonation is perfect, can play half open chords anywhere. Haven't cranked it yet, looking forward to that. Here it is. Just arrived today At 7.8 lbs it's just a touch lighter than my recent nothing-special AmStd HSS strat. Plays like a breeze. Haven't restrung it yet... intonation is perfect, can play half opwn chords anywhere. Haven't cranked it yet, looking forward to that.